Heavy duty ratchets and straps, brand new. Do you need to strap down your frames to the side of your wagon, or inside? Do they keep bouncing all over the place because you do not have any straps? Do you need to strap anything down? 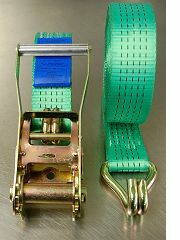 We have these brand new 8 or 12 metre long straps, rated at 5 tonnes. They are made to the EN 12195 standards and have been tested by an accredited GS/TuV testing house. They are sold in boxes of 5 or 10, or can be bought individually. 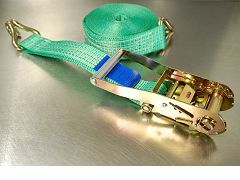 The colour of the strap is either green or blue. Delivery cost for this item is from £7 for an overnight during the working week (Monday to Friday) if ordered before 3pm. Prices start from £7.50 each.